Parking on piles of dry fallen leaves is a fire hazard. Wet leaves on the road are a red flag, so slow your roll. Hard acceleration or sudden braking and sharp turns should be avoided when traveling over wet leaves. Give yourself more of a stopping distance from the vehicle in front when the ground is wet to prevent a rear end collision. Fall can also be a damp time with rainy or foggy mornings and evenings. We also fallback time-wise during autumn and this can result in loss of visibility on the roads because it gets darker sooner. Turn on your headlights during dusk and dawn. FYI, low beam headlights aim the light down toward the road making it easier to see; high beams will only cause glare. In autumn, deer tend to want to get their freak on so you might wind up encountering one or two on the road, especially during dusk and dawn. If you see a deer on the side of the road, reduce your speed and proceed with extra caution. Keep in mind, deer like to hang with their buddies, so if you see one, more than likely, there are more to come, and they tend to dart out into traffic. Intense sunrises/sunsets, and fall go hand in hand and sure we marvel at their beauty but when driving, not so much. With the beauty of the brightness comes extreme sun glare that can impact your visibility behind the wheel. Battle the brights by using your visor, putting more distance between yourself and the vehicle up ahead and sporting a pair of shades. Parking on piles of dry fallen leaves is a fire hazard. Dry leaves can ignite and the resulting fire can quickly overtake your car. 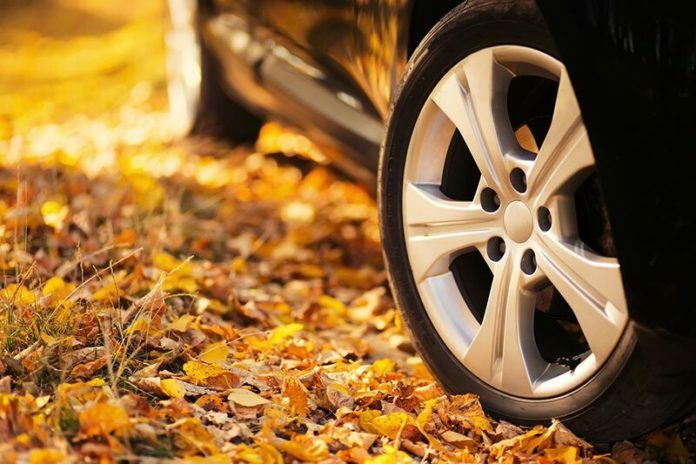 It’s also best to avoid parking your car under trees that are shedding leaves, if possible. The leaves can cause stains and if leaves get lodged in air vents, be sure to pull them out before you drive. Make sure to keep your windshield clean, inside and out, free of smudges and streaks that can compromise visibility especially when the sun is at its brightest. Make sure your wiper blades can still swipe appropriately, if not, replace them. Leaf piles are so inviting to kids. Little ones love to jump, burrow, and hide in heaps of raked leaves left next to the curb. Never, ever, drive over a pile of leaves.